Click on one of the thumbnails above to see an enlargement. The town of Victoria, Texas, was founded in 1824 by Martin de Leon, no relation (so far as I know) to the Spanish explorer, Ponce De Leon of Florida/Fountain of Youth fame. Victoria is about halfway between Houston and Corpus Christi, and is 20 miles inland from Port LaVaca. The Victoria Country Club was founded in 1924, as a playground for the wealthy oil and cattle barons of the day. The VCC is a full-service country club, complete with golf, tennis and a swimming pool, not to mention the normal restaurant and banquet facilities. 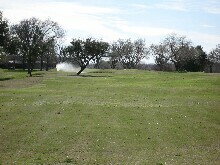 I played the golf course in early February, and the fairways had gone dormant. Despite this, temperatures still ranged from the mid to high seventies during the warmest part of the day. Furthermore, they were doing a lot of repairwork around edges of the greens, which was a pain in the neck for greenside chip shots. However, the greens rolled fast and true. Speed and break are very hard to gauge correctly because the greens all tend to have a lot of undulations to them. You have to be a guest of one of the members in order to get on the course. The staff was courteous and friendly. Guest fees are $50/person. Carts are $14/person. 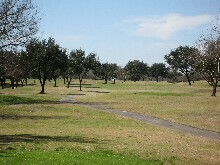 Push carts are not available for rent, although you are certainly welcome to walk the course, which is relatively flat. It's an old style course, with the holes laid out contiguously (no long drives between greens and tees). 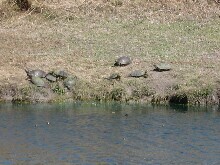 Pay attention to the edges of the ponds -- you might get to see a whole herd of turtles out sunning! 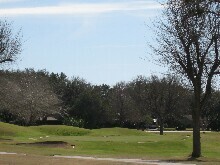 The course plays at 6870 from the tips. It has a good mixture of long, short and medium length holes. This review was written from the white tees, which play 6327 yards. #1 is a short par5, playing only 471 yards from the white. 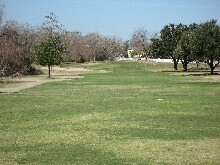 It's handicapped as the easiest hole on the course, and in many places would be considered a long par 4. Despite the relatively shortness, beware of playing a long iron or a fairway wood in if you have any tendency to either pull the ball or draw it -- there is a pond that will gobble up anything short and left. A safer play is just to hit your three wood off the tee, and lay up to your favorite distance and try to get your third shot close to the pin for a birdie attempt. 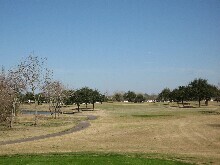 #2 is a 392 yard par 4, with a slight dogleg left. Don't try to cut the corner -- there's a pond guarding the dogleg. The third hole is a long par 4, playing 427 yards. It's straightaway, and there's room enough to hit your driver. There's a swale fronting the green, and I imagine that sometimes there can be creek or a swamp running through it, so take care to hit a quality approach shot. #4 is the second par 5 on the front, and it plays 489 yards. The tee shot feels a little tighter than it really is because of a tree that is not to far off the right hand side of the tree. However, the fairway widens out and is actually pretty roomy. If your drive turns out to be too short to go for the green, lay up for position. However, if you find yourself in a position to go for it, be conscious of the bunkers fronting the green. 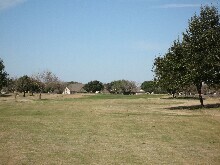 #5 is a 385 yard par 4. The teebox lines you up directly at a bunker on the left side of the fairway. 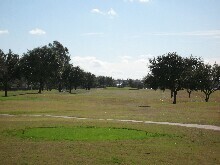 However, if your try to aim to the right, you're aiming at a tree that sits on the corner of a slight dogleg. Golfers with a natural fade should aim at the bunker and let the ball drift right. On the other hand, if you tend to hit draws, you might be better off with a more lofted club, like a three wood, and aim at the tree, hoping that if the draw doesn't develop, you get enough height to clear the tree. #6 is a longish par 3, playing 195 yards. A short miss is better than a wide miss, so pressure yourself into hitting a wild shot with a long iron. 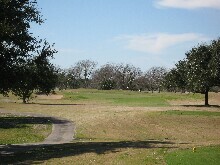 #7 is a short par 4, playing only 310 yards from the white tee. It's well guarded by a pond on the right, so the smart play here is to hit your 200 yard straight shot, leaving a comfortable wedge into the green. I let my tee shot drift a bit right, and while it was still well short of the pond, I had an awkward lie, and hit an uncomfortable wedge into the water. Do what I say, not what I do, stay in the middle! The eighth hole is a 167 yard par 3, with no trouble in play to speak of. Smack it onto the middle of the green. 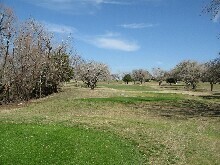 #9 plays at 376 yards, with a dogleg left around a clump of trees. If you hit your drive too fair right, you can run out of fairway because of the dogleg, so either hit your driver down the center or left side of the fairway, or use your three wood and accept a longer shot into the green. 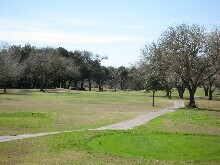 #10 is a long hole (390 yards) with a pronounced dogleg to the right around a grove of trees. 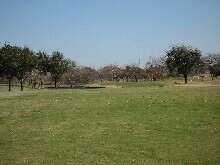 I'd like to have another chance at it because I hit a big slice into those trees, and the rest wasn't pretty. What I meant to do was hit it right of the bunker on the left side of the fairway with a slight fade, which probably would have worked a lot better. The green is a bit elevated, so take an extra club on your approach. Anything short will hit the hill and stop dead. This hole is handicapped as the hardest one on the course. #11 comes back beside #10, and doglegs left. This hole is only 329 yards, and a driver will probably run through the fairway, so it's better to use a fairway wood or an iron off the tee. 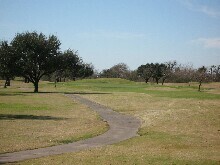 #12 is a short par 4. The scorecard reads 114 yards, but where they put the white tee was more like 140 yards. So find a yardage marker before you tee off. This hole demands accuracy, since the green is well-bunkered to compensate for its short distance. #13 is another short par 5 at 475 yards. It doglegs left a bit, but you can safely ignore that, and hit your driver as far as you want down the middle. 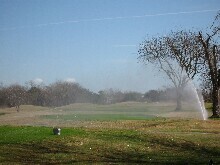 There are trees on both sides, so if you're not hitting your driver straight, back off to another club. There's lots of protection around the green to challenge your chipping if you come up short. #14 is a 354 yard par 4. It dog legs left a bit, and has a tree guarding the corner, so try to stay on the right half of the fairway. The fifteenth is a short par 3, playing 136 yards. It's bunkered left and right, so you have to hit it straight. But it's not that far, so smack it on, make your two putts, scoop up a par, and move on. 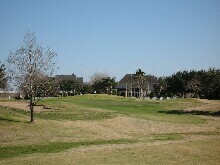 #16 is a bit more challenging, playing 399 yards, over a hill, with a dogleg left. Because of its length, you need a good drive here, but you also need one that's straight. There are obstacles off the fairway in the form of trees and bunkers, so straight is your friend. This hole is the second hardest hole on the back nine. #17 is 388 yards, with OB on the right because of the driving range. Be careful because the hole also doglegs right. Stay in the fairway. The home hole is a 535 yard par 5, with a narrow approach area inside of 100 yards (the "narrow" here is caused by a pond on the left). Play it like a three shot hole, and don't bring that pond into play. There's also a bunker on the right of the green to steer clear of.